Two things I never expected to happen when I launched this blog last month: 1) that it would get the kind of traffic it’s been getting – thank you! (even my dad subscribed to it! ), and 2) that my dad would not only comment on a post, but also write an unsolicited guest post! My dad is a technology-savvy guy (he’s the guy at the left of the picture), so it probably shouldn’t surprise me, but it did – and I’m delighted to share his story with you. And, to find out more about my dad’s (and the family’s) day job, click here. This past Saturday was one of those rare occasions when my lovely wife Pam and I decided to go out for dinner. Okay, maybe not rare. Okay, maybe not rare at all…we have dinner out every Saturday. 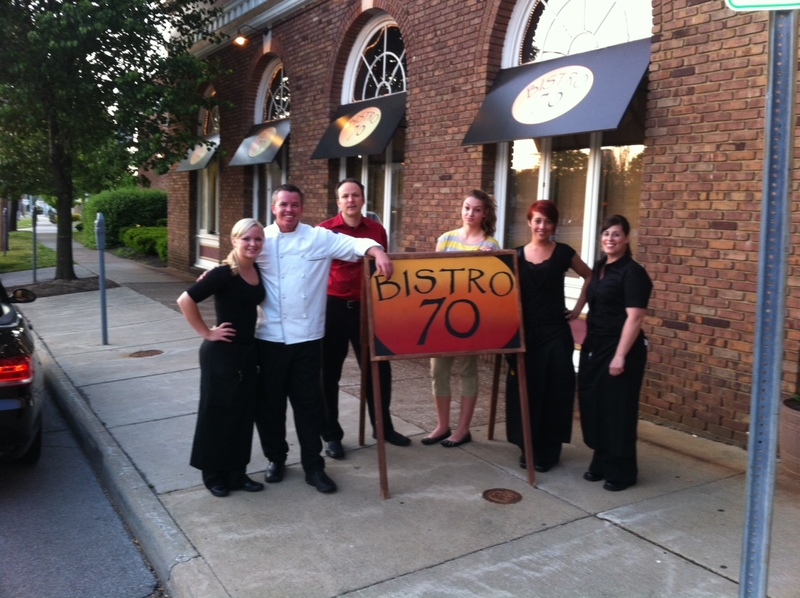 More often than not, we find ourselves at our favorite dining establishment Bistro 70, in downtown Painesville, OH. 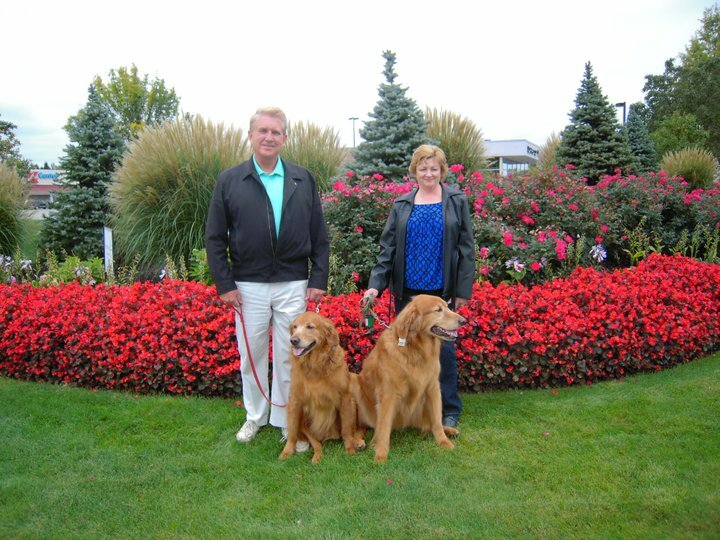 Terry and Pam, and their second set of children (post – Adam and Ker leaving the nest), Molly and Tucker. IMO, this little gem of a restaurant is one of – if not the best – fine dining experiences to be found in Lake County, and perhaps in all of NE Ohio. From the rather unassuming street level entry at 70 North St. Clair Street (hence the name) you might never suspect the fabulous treat in store. 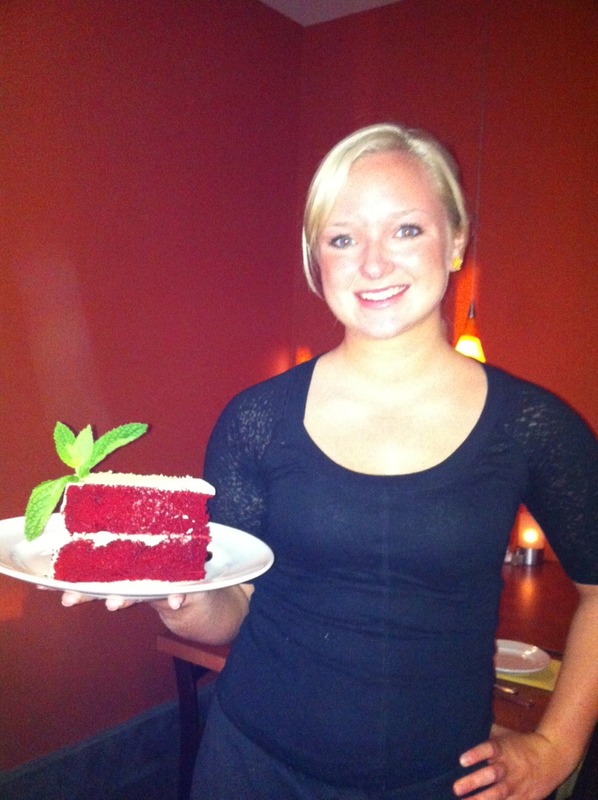 We are always greeted warmly by Hostess Vivian, and Katie – one of several friendly and cheerful severs. Most visits, Katie gets stuck with us. Once again on Saturday, she drew the short straw, and we were very lucky. Once seated at our corner table, Pam had her wine and I had my standard iced tea. Truthfully, I did not intend to have Katie pick my meal tonight. But, in addition to a great menu on the weekends, Chef Keith prepares three scrumptious specials. Saturday was no exception. 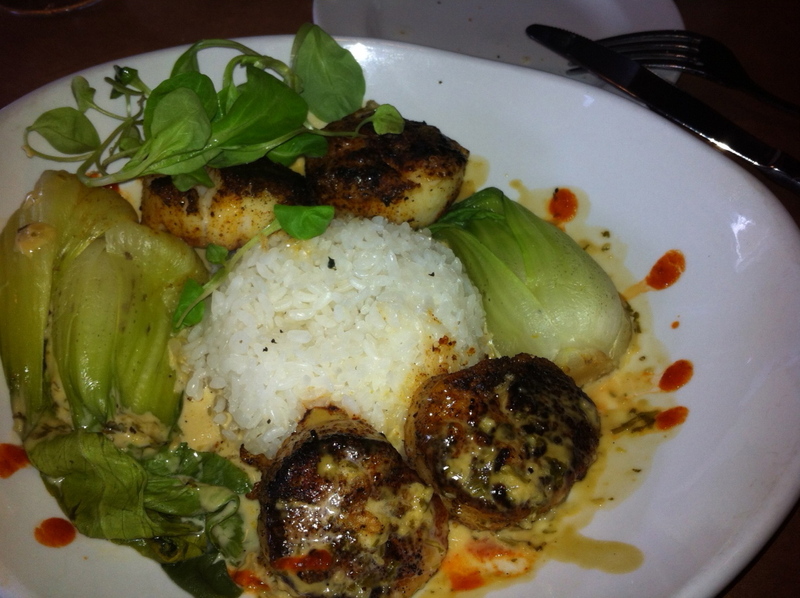 The choices included a seafood dish: blackened divers scallops, roasted bok choy, and sticky rice. The second dish was surf and turf, Bistro 70 style: filet and crab, with asparagus, and potato. Finally, a black and blue pasta dish with pasta (obviously! ), filet, crumbled blue cheese, and a beef-based sauce. All sounded delicious, and therein was my dilemma. Just like my daughter Kerri often is, I became momentarily indecisive. After my wife ordered the black and blue pasta special, the die was cast – I would become a guest blogger on “She ordered what?!?”! Katie was thrilled to select my meal for. I had no idea if it would be one of the specials, or something off the menu. What I did know is that I was in very capable hands. Not only is everything very good at Bistro 70, as I mentioned Katie is our sever regularly, so she has a pretty good idea that I will eat almost anything. 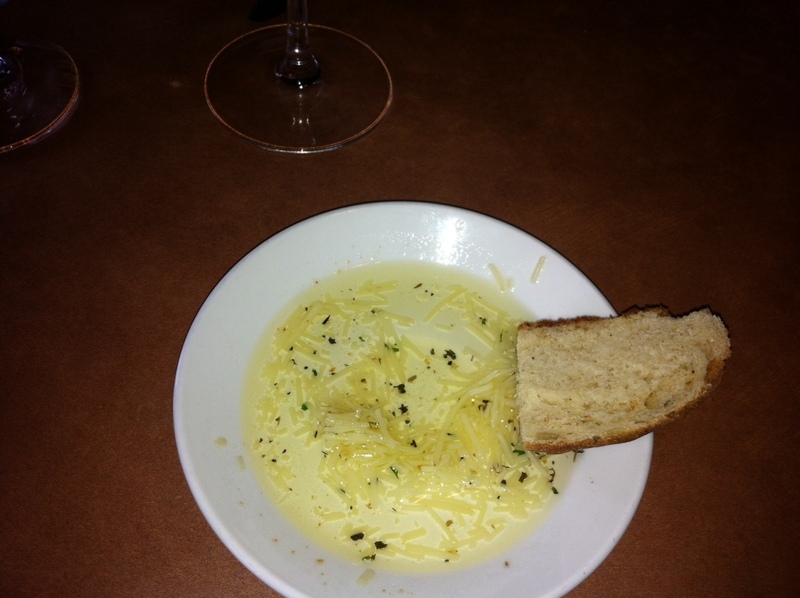 Meals always start with warm bread served with olive oil and cheese for dipping. (no butter). Tonight was not an exception. This was followed soon after by a small house salad of greens, tomato, onion and house made blue cheese dressing. Both the bread and the salad hit the spot, since on Saturdays neither of us take time for lunch. It was a long time between breakfast and dinner, and we were hungry! Soon enough, it was time for my mystery entrée. The black and blue pasta Pam ordered looked and smelled terrific. I was kept in suspense until Katie placed a beautifully plated blackened scallop dinner in front of me. Here are the details: three V-10 divers scallops, pan-seared, finished with a white wine miso butter sauce, braised bok choy and sticky rice. Blackened diver scallops, braised bok choy, and sticky rice. (I know the picture shows four scallops – I guess I am special). Occasionally I order the scallops off the menu, as good as they are Saturday’s special was truly, well, special! Perfectly prepared, scallops were firm yet tender, blackened just enough to enhance the flavor, the white wine miso butter sauce a provided a creamy texture. The braised bok choy was flavorful, and sticky rice is always good. 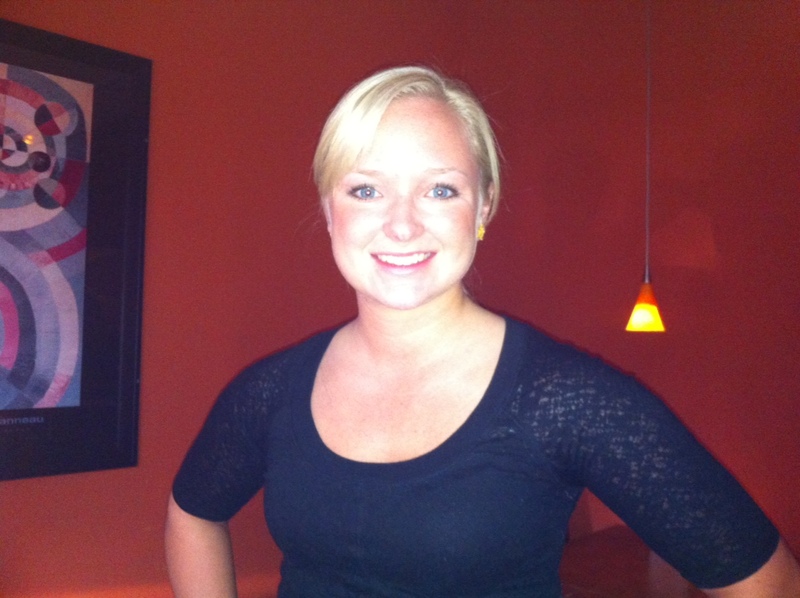 Kudos to Katie – she did a great job. I thoroughly enjoyed my dinner. Hats off to Keith – he prepared another excellent dinner. Ah, but it is not over. Recently, like last week recently, Bistro 70 started serving special desserts. The multi-talented server Katie is also a baker. Not just an ordinary baker, but a baker of the most exquisite, and moist cakes. Keith started purchasing Katie’s cakes last week. She prepares a different cake each week. While we normally do not indulge in desserts, except perhaps on special occasions, how could we pass up red velvet cake with cream cheese and brown sugar frosting? Along with a cup of fresh-brewed coffee, and great service, a perfect ending to another great dining experience at Bistro 70. 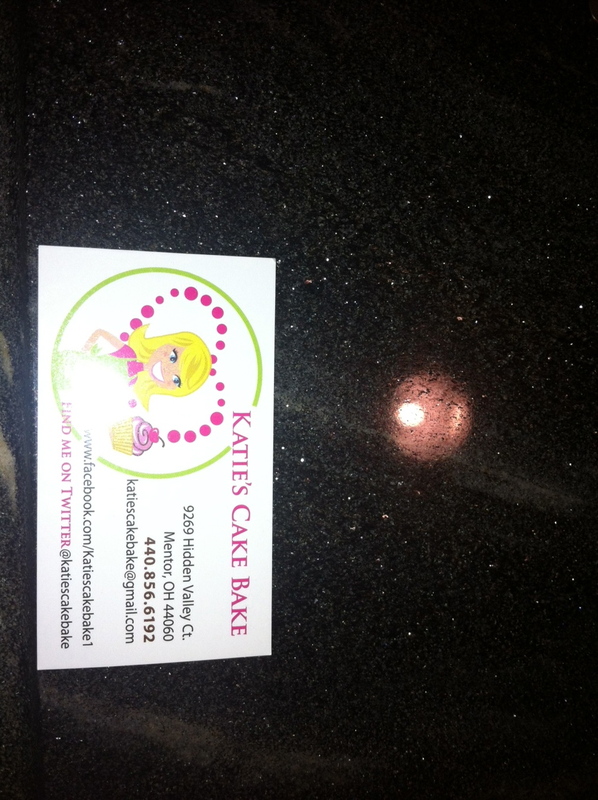 And, if you’re interested in Katie’s cakes, tweet her, email (katiescakebake@gmail.com) her or give her a call (440.856.6192)! Thank you, Pops , for sharing your story, and for highlighting a restaurant I know and love – and am so glad I introduced you to Keith and the gang so many years ago! Great post! Thoroughly enjoyed reading his experience. His subtle humor paired with the “text talk” held my interest and kept me smiling! Sold! A trip to OH is definitely in order now! 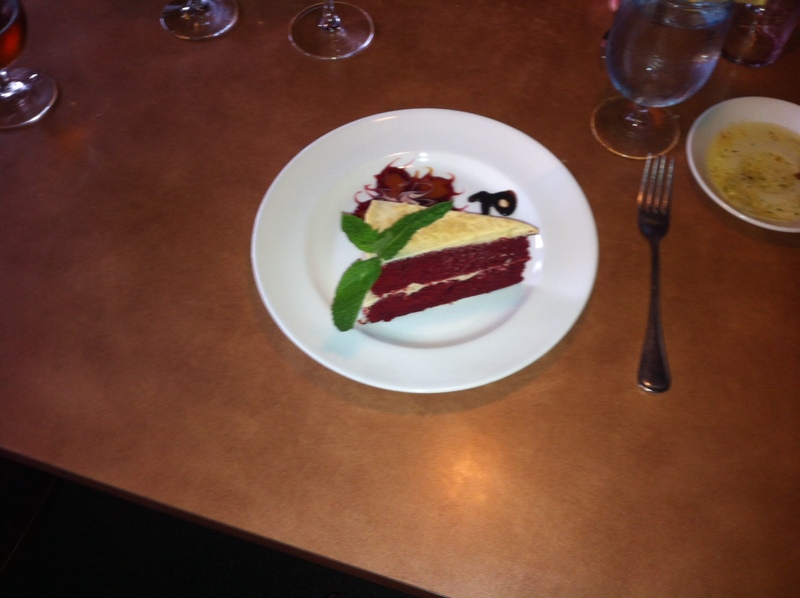 🙂 The blackened scallops look amazing and I must say that the red velvet cake looks equally scrumptious. A deliciously awesome post TK! To everyone thanks for all the kind words. It was fun and reasonably safe since we know the restaurant so well i could not go wrong. Pam said the black and blue pasta was very good.They sometimes prepare it with chicken and sometimes with beef. She couldn’t quite finish it. (saving room for red velvet cake). I am having the reamains (I don’t do leftovers) for lunch today. What a great post! And those dogs are adorable! On behalf of my dad, thanks, Jen! And, sadly, they lost Tucker last year, but Molly is still an adorable love of their lives. Glad you enjoyed his post. Pingback: Brad Marley » Blog Archive » Five and One with Kerri Kilbourne, blogger at She Ordered What?!? from. Thank you for posting when you have the opportunity, Guess I’ll just bookmark this page. number of the subjects you write regarding here. Thanks for your comment, Sibyl. Input is always appreciated, so please feel free to reach out to me. Guest posts are welcome as well!